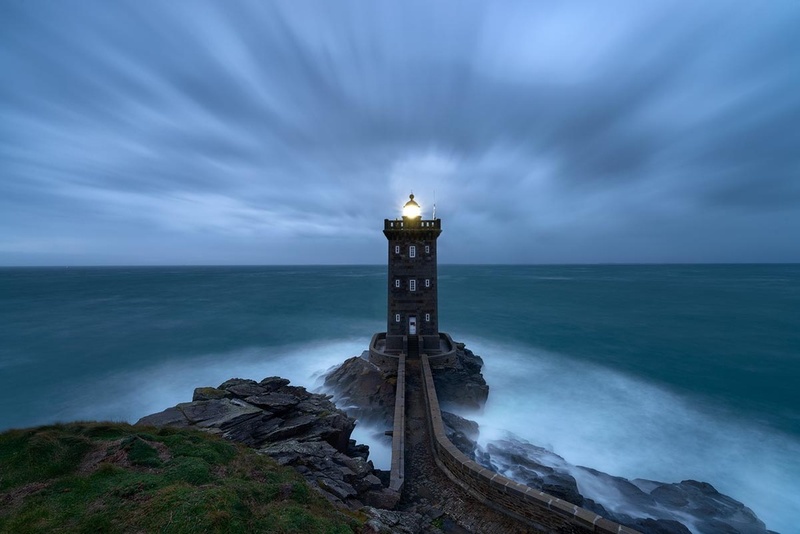 Blue hour shot on a stormy morning in Bretagne, France. The weather forecast has predicted super strong winds from the west, so it was the perfect occasion to go visit this place for the first time. After a 10h drive, we decided to go look at the place the night before. The winds was so strong it almost got knocked over, so we decided it was safer to wait until morning to come back. After setting up in the dark, adding the long metal spikes to the tripod's feet to have a better grip on the wet grass, I also attached my heavy camera bag to the hook under the tripod. I also got my metal spikes on the shoes, as it was still super windy and almost fell hiking to the vantage point. The clouds were coming straight at us so I really wanted to try a long exposure to get the nice streaks of clouds but thought with the crazy winds it would be probably impossible. That was without counting on my amazing RRS tripod that was able to keep the shot steady for the 30s exposure. At times the lens would get covered in sea spray as well but it depended on the amount of waves crashing on the right side. With a bit of luck and good timing I was able to capture this exciting moment. This area gets some great storms all year long and being there to capture that moment was such a nice treat. A big thanks to my brother for the long drive to this place!